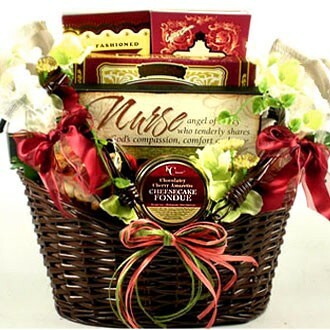 This elegant gift basket for nurses is a great way to thank a nurse or caregiver for their compassion, comfort, care, hard work and dedication to patients. Show the special nurse or caregiver in your life how much you care with this exquisite gift basket designed especially for nurses! Our nurse gift basket features a beautiful painted basket with movable side handles; trimmed with elegant silk flowers and topped with a designer bow! Inside the nurse will find a decorative wooden plaque for their desk or wall that reads “Nurse.. angel of mercy who tenderly shares God’s compassion, comfort and care."